Mark Zuckerberg, CEO of Facebook, Inc.
Its known that the largest social platform prioritizes video, amongst other because it has found clear evidence in the data that video drives user engagement - and is better at that than all other media. However, at the same time you realize that video is also the most complex to get right, and text ads are easier to tackle - for you but also for your competitors. Complexity tends to be where the opportunity is at. This book is for people who want to seize the video opportunity to drive business results. Powered by sound, sight and measurement - and amplified by networking - social video ads are your most powerful tool to drive business results way beyond ‘branding’. Marketers have a massive opportunity on their hands to measurably drive business outcomes using social video campaigns. 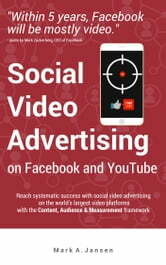 In the book Social Video Advertising, author Mark A. Jansen shares learnings from running hundreds of YouTube and Facebook video campaigns. Experience gained from being at the media sales side at YouTube (Google) as well as advertiser client-side. Google and Facebook now earn over 80% of global online advertising budgets, so there is a very large chance you will end up running social video on either Facebook or YouTube - or both. Time and time again, performance marketers say they are having a hard time measuring the ROI of online video (eConsultancy, Marketing Budgets 2015). A whopping 39% use the word ‘poor’ to describe their ability to measure of ROI for online video. Compare that to the status of paid search as the top digital channel for ability to measure success: over half of respondents (52%) rated their ability to measure ROI from PPC as ‘good’, while another 35% rated it as ‘okay’. 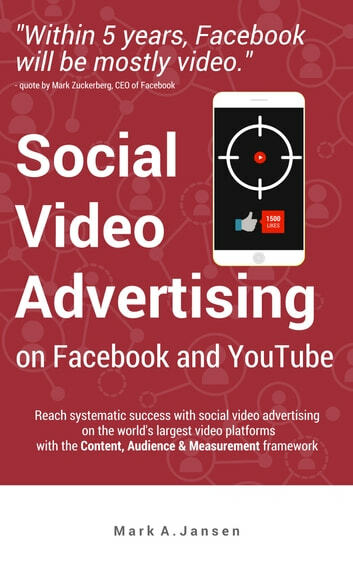 Clearly, social video suffers from a measurement challenge, and this book gives you clear pointers on how to solve this challenge. By the time you reach the conclusion of this book, you will be running highly effective social video campaigns, be able to define an appropriate online video campaign measurement plan that follows from the overarching marketing goal, and then demonstrate that your investment in video campaigns is achieving a positive ROI. Use this to convince budget decision makers and prove that your online video campaigns are adding to top-line growth. The reader is assumed to have a background in performance marketing and to be a heavy user of conversion tracking to measure outcomes and optimize ad results. This book is most relevant for those whose website or app is a fundamental, ‘core’ part of the business. The measurement framework in this book assumes you are an online pure play company. This brings the associated benefits of having easy access to timely data on user behavior in your digital product and how your ads drives this behavior.